Cats in general, especially African lions, are known to hate the water. For this pride, it seemed like a fun day out for the family. Mike Kirkman, a 37-year-old head ranger in Mala Mala Game Reserve in Greater Kruger, captured this family-outing to the Sand River on Mala Mala. Kirkman tells Latest Sightings, “I had followed the lioness to a thicket where she called her cubs who were hidden. Once they came out, we followed them to the river where they lay down in the water, then moved on again to where she and two male lions had killed a buffalo. "The next day I found the lions at the same carcass and the males also now in the water, where she joined them. The cubs can also be seen running around in the area playing in the river. Kirkman explains the pride, known as the Charleston Pride, have been known to lay in shallow water, but he had never seen them "as deep as this and evidently enjoying being cooled off". "The cubs obviously thought this was completely normal and so just carried on," he says. "These are the only lions and indeed the only cats that I have ever seen in the wild just plop down in the river to cool off and have fun in the water." In all his 15 years of guiding he has not experienced anything like this and does not expect to again. Kirkman suspects this unusual nature must have been learned behaviour. 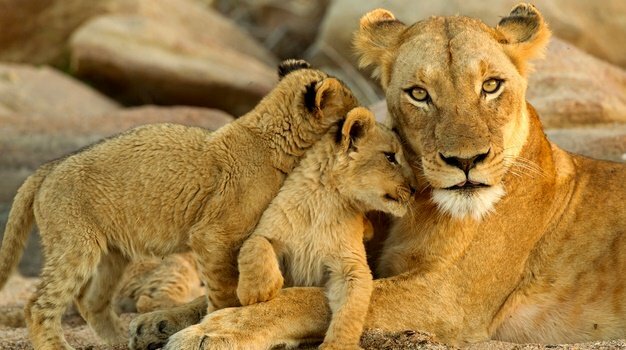 "The two males (Charleston Males) are quite well-known and recognizable as one had a tooth knocked loose and hanging down like a saber-tooth cat for some time," he says, "the lioness and cubs moved into Kruger eventually." "The only theory I have it that for some reason the lioness learned to do it and then passed it on to the two males." Kirkman explains they are the nephews of one of the females who has raised them after their mother was killed. "I have no idea why these lions don’t have a dislike to the water like most lions do." The lions eventually moved off after they had finished their buffalo.